Three of Pentacles deals with the importance of teamwork and its contribution in successfully reaching goals and completing projects on time. Three people stand close to a stone building that has all the appearances of a church. The young man standing on the bench appears to have been busy. One of the other figures appears to hold the plans of the building. The young man is working on and we may assume that he is the architect of this fine structure. The third figure is that of a monk so let us presume. It has commissioned the build and hired those with the necessary knowledge, skills and qualifications to carry out the work. In the Three of Pentacles we explore the nature of the Group and how we work within groups who have a common goal. Individually they have their own field of expertise. However, they need each other’s expertise to complete the project they are working on. The Monk, being a man of the cloth knows what he wants for his church. He also has a budget that he must operate within. The Monk has hired the expertise of an architect who will draw up the necessary plans based on his requirements. The architect will explain to the monk. What is possible and what is not and provide several drafts before anything is finally settled upon. Once the plans have been officially signed off. They must then find the right builders and specialized tradesmen to provide them with the finished product as per specifications. The church must also be built within a certain time frame and come in on budget. It will take the cooperation of all within this group to achieve such a lofty ambition. All must be committed to the task. All must give it their very best and work to the highest standards possible. And what of their reward for such focused effort? With this being a Pentacle card material gain is extremely important so all will expect to be handsomely paid for their time. 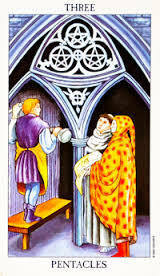 However, the Three of Pentacles deals with more than just an honest day’s pay for an honest day’s work. Recognition for their work is also extremely important. The Three of Pentacles depicts several qualities: knowledge, values, effort and patience. Working together with your partner. Study, Learning, Scholarships, Mentors, Teamwork, Material Growth, Building on Solid Foundations, Commitment, Long Term Plans, Craftsmanship, Quality, Attention to Detail, Recognition, Achievements, Efforts Paying Off, Determination, Goals, Renovations, Building Trade, Architects, Plans.